4) Reappraisal of somatic and emotional state. The experience of our own success builds up our perceived self-efficacy while experiencing failure lowers our perceived self-efficacy. However, if our successes are too easily achieved we do not learn any efficacy in the face of obstacles and our built up perceived self-efficacy collapses at the first unexpected setback. A robust sense of self-efficacy comes from the experience of overcoming obstacles; mastery is something that requires effort and leads to success. Through the observed efforts and results of others we influence what effort we expect to lead to what results in our own behaviour. This social modelling depends highly on the perceived similarity between the social model and ourselves; the more similar we judge them to be to ourselves, the more our perceived self-efficacy shifts depending on the efforts and results of the model. We look for models that display the skills we desire and try to learn ways to achieve such skills from them, leading to a higher sense of perceived self-efficacy. Persuading people that they are capable of mastery can heighten perceived self-efficacy in the sense that it can lead to a short-lived increase of effort and commitment, whereas people might have given up without such persuasion, resulting in a successful mastery experience. However, it is easier to undermine self-efficacy through social persuasion than it is to promote is. Psychological boosts are easily deflated by reality and do not provide any resilience over time. Social persuasion is more successful when it focuses on teaching people how to structure situations to maximize the chance of success and measuring success in terms of self-improvement instead of comparison to others. We tend to interpret our physical responses and our mood-state as related to our capabilities, while this need not be the case. 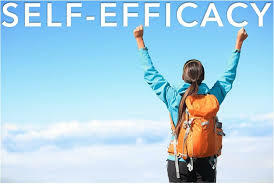 Persons with a high sense of self-efficacy can interpret a state of arousal as a motor to action whereas persons with a low sense of self-efficacy can interpret the same state as an obstacle to action, or even an indication to cease all efforts. Since these are the same states, it is not so much the occurrence but the interpretation that determines its’ influence on perceived self-efficacy. The interpretation of such physiological indicators appears to be most important when it pertains to health functioning and physical activity. One experiment that follows the line of Reappraisal of somatic and emotional state is the work of Alison Wood Brooks (2013) “Get Excited: Reappraising Pre-Performance Anxiety as Excitement”. She conducts several experiments in which participants are faced with tasks that make them anxious and are prompted beforehand – or prompt themselves – either with “I am calm” or with “I am excited”. The calm-prompt follows the usually taught response to being anxious, which is to try and calm down. In these experiments Brooks consistently found that the participants with the excited-prompt performed better on their tasks while remaining highly aroused, this was measured by raised heart rates throughout, as compared to the calm-prompt participants (Brooks, 2013). Bandura, A. (2004). Health promotion by social cognitive means. Health education & behavior, 31(2), 143-164. Brooks, A. W. (2013). Get Excited: Reappraising Pre-Performance Anxiety as Excitement. Maher, K. (2014). The effect of youth diabetes self-efficacy on the relation among family conflict, disease care and glycemic control. (PhD Dissertation ), Virginia Commonwealth University. Let us start off with the comment that to me, using ‘Apps’ as a distinctive category is the same sort of categorisation as ‘Books’. It is a media-format. It might be a little more suitable for some content than for others, but building a good App cannot be viewed without inspecting the content. So what defines an App? After some scouring of the Internet I define Apps as an application or piece of software that is small, has a limited use, can be used instantly and is developed for the mobile platform. In the last feature we find marvellous possibilities for Gamification. In our pockets (or handbags) we carry a sensor array concealed as a device for making phone calls. With every smartphone we carry around the possibility for audio visual processing, timekeeping, location tracking and an open connection to the world biggest collection of information. All means for measurement which can be used to power feedback, or to build henceforth unseen structures overlaying our reality. In more ways than one – Gamification is the art of creating new and inventive ways for feedback. A game structure, or a part thereof, can hold a story and through that story we can find (new) meaning. In our hand we hold the technical tools necessary for measurement and processing, while in our head we can hold structures linking such measurements together. The way this is woven together gives meaning to cold, hard data. 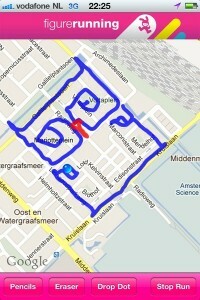 Figure Running for example, uses the measurement of GPS, placing the collected data over the existing structures of maps and adds the creative freedom of drawing on this map with your feet. We can interpret the resulting drawing for it is telling us a story. Through technical application and feedback we’ve created a new structure in reality. Sounds like a game to me. I would encourage the masses of Appmakers to view the measurement data they can tap into as opportunities for feedback, to see such data as building blocks for unseen structures and the idea of play as a way to weave such things together. Gamification is a very useful framework to look at your user and to go from pointless data to engaging information. Brilliant: The Science of How We Get Smarter from International Festival of Arts & on Vimeo.